Do you have to have an operation? Scared? Have you had past anaesthetic in hospital that made you vomit for hours? 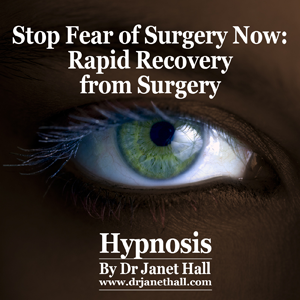 DR JAN’S “STOP FEAR OF SURGERY” HYPNOSIS AUDIO IS THE RESULT OF MANY YEARS SUCCESS WITH CLIENTS. Dr Jan sees people on a one-to-one basis and has had a lot of success in dealing with those who need to overcome their fear of surgery and program themselves to have rapid recovery from surgery. This recording comes from Dr Jan’s clinical success with helping clients recover rapidly from surgery. The concept that self-hypnosis training can help reduce the anxiety associated with surgery probably makes sense to you. Self-hypnosis can also help surgery go more smoothly and actually accelerate physical healing itself! You will probably find that your anxiety about the surgery is reduced and that you are learning to control your internal state and give yourself soothing positive suggestions. Hypnosis is state of focused awareness that you go in and out of every day whenever you are particularly absorbed in on a thought or an interesting task. What self hypnosis training does is teach you how to go into this state willfully, under your own control. Research shows that just spending time in hypnosis can help normalize your body’s homeostasis and equilibrium. It also can help reduce stress and anxiety. whether the method of hypnotic induction (live versus audiotape) affects hypnosis efficacy. The results revealed a significant effect size (D = 1.20), indicating that surgical patients in hypnosis treatment groups had better outcomes than 89% of patients in control groups. These results support the position that hypnosis is an effective adjunctive procedure for a wide variety of surgical patients. Dr Jan’s Rapid Recovery from Surgery or Illness hypnosis session may help you speed up your recovery rates. You’ll notice the difference quickly, as your body learns to heal faster and more effectively. Simply sit back and listen as Recovering from Surgery or Illness helps you unleash the power to regenerate your body and leave you feeling fit and healthy. Stay calm and expect the surgery will go smoothly without any drama. Accelerate the natural recovery process with no reaction to anaesthetic. Receive maximum benefit from your surgery. The authors conducted meta-analyses of published controlled studies (n = 20) that used hypnosis with surgical patients to determine: 1) overall, whether hypnosis has a significant beneficial impact, 2) whether there are outcomes for which hypnosis is relatively more effective, and 3) whether the method of hypnotic induction (live versus audiotape) affects hypnosis efficacy. After my hysterectomy, the Doctor was amazed that I wanted to go home after three days. He recommended that the normal stay was seven days. He was astounded to learn that the reason that I believed that I had made a rapid recovery was that I had listened to Dr Jan’s hypnotic recording before and after the operation and programmed myself to a serene and successful operation and problem-free recovery.